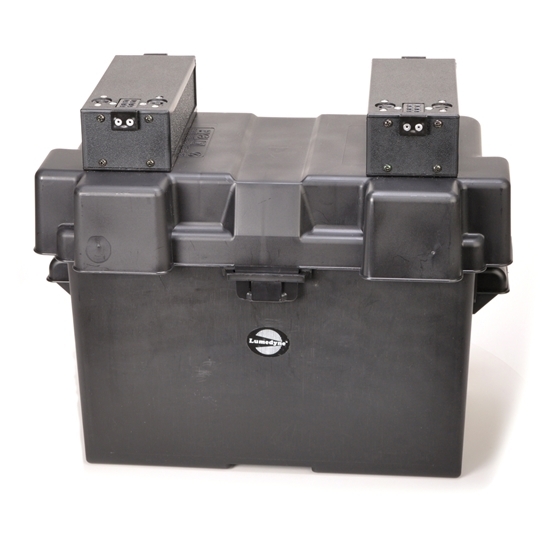 The BC12 is a great enclosure for extra large or large size vehicle batteries that you add inside of it. Then it can run one or two flash systems right off the top. If your Power Pack has a battery gauge, it will work on this type of battery too. The BC12 has the added high current connections needed to run the Extra Fast High Speed Modules. You can also connect all of the normal Power Packs and Boosters. More power to ya, stack it up... The Battery tops that allow you to lock on one or two flash systems are securely mounted and strong but also have electronics to help protect your battery. There is a strap included to keep it closed while you are on location. Because you add your own battery to the enclosure, we cannot tell you how many flashes per charge you will get. In rough terms, a 45 amp hour car battery would give about 3000 flashes at 200ws if you drained it down fully. We recommend a marine battery or one that is considered a "deep cycle" battery because each recycle is a real high current drain on the battery. Once you are finished, you will need your own recharger for your battery. You MUST get the polarity correct and ONLY connect the red wires to positive and the black wires to negative battery terminals. It is not more technical than that. Remember that no battery is included, you have to add that and your own charger.